Faith and Begorrah, St. Patrick's Day is almost here! Just in time for the festivities on March 17, The Irish Gift House has created a new section on our site that is appropriately named St. Patrick's Day Accessories. You will quickly see that If you are looking for a place to get your green on for high holy day you have found the right spot. For the wearin' of the green we have an assortment of St. Patrick's Day Clothing and Costumes that range from Irish party hats and green wigs for your head to shamrock socks and slippers for your feet along with a host of other festive accessories. The green shamrock is the most recognizable symbol associated with Ireland and it can be found with great abundance among our St. Patrick's Day Decorations. You will find embellishments worthy of the Irish saint that will adorn your home from the ceiling to table that include cut outs along with banners and centerpieces. Everyone is Irish on March 17 and everyone will appreciate celebratory St. Patrick's Day gifts. For that reason we have assembled an eclectic assortment of fun favors that will amuse the young and old alike. Many of these gifts could easily also act as decorations or as the last detail for your outfit and range from plush leprechauns to shamrock dice. To pull off this grand day in style you may want to browse our selection of St. Patrick's Day Jewelry. Here you will find silver tone or gold tone metal bracelets and necklaces along with earrings and lapel pins that are enhanced with shamrocks galore. Many of these pieces also feature the Claddagh and some have Celtic knots. Last but not least is the selection of St. Patrick's Day Beaded Jewelry. 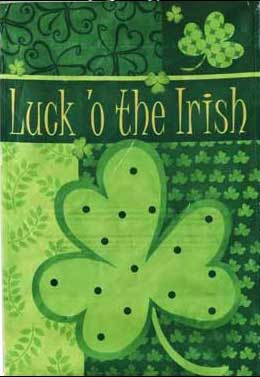 This category features shiny and inexpensive green beads for your Irish celebration. This jewelry is ideal for sharing with your friends and that will surely bring you the luck of the Irish.